It’s official, Starbucks just welcomed back their Pumpkin Spice drink, which means it is officially fall! The cold crisp air and the color- changing leaves makes everything picture-esque. Cue, the beautiful white dresses draping the rich ground. If you want to achieve a modern fall themed wedding, then keep on reading. 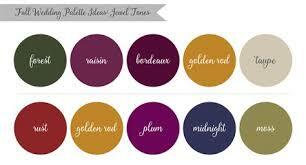 This year’s color palette does not stray far from your warm notes of reds, oranges, and browns. Copper, a cool shade will brighten up any dull, cold day. We recommend our readers to incorporate copper with gold to “jazz” things up. You can add elegance with deep emerald green, plum, or neutral colors like champagne, cream, and slate grey. 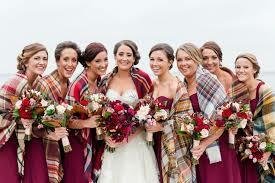 Since the weather will be a lot cooler, it’s best to go with thicker fabrics for your bridesmaid dresses. Adding boleros and pashminas is a perfect way to keep your squad warm. Get quirky with argyle socks and plaid patterns! The fall staples complements the groomsmen nicely with some suave navy suits. As for the bridesmaids, deep jewel tones, shimmering metallics, and long- sleeved bridesmaid dresses will look beautiful with the summer glow! Flowers are must in weddings, it’s a fun way to incorporate the season. There many flowers that bloom year- round, but in- season autumnal flowers perfects any wedding. To go with the deep tones, burgundy Dahlias are exceptionally beautiful in the fall. Garden Rose is another flower that brings subtlety to any floral arrangement. Garden rose also come in variety of colors and they are a great alternative to peonies. Black Cosmos have an eerie and dark look to them, which is perfect for the fall! Black cosmos are great to add to your arrangement without obscuring anything. For rustic accent, Scabiosa pods and Andromeda will give your arrangement some edge. Remember, Fall is about deep tones, but don't forget to add some quirkiness to add some originality. We hope that these tips will help you achieve your dream wedding. It’s official, Starbucks just welcomed back their Pumpkin Spice drink, which means it is officially fall! The cold crisp air and the color- changing leaves makes everything picture-esque. Cue, the beautiful white dresses draping the rich ground. If you want to achieve modern fall themed wedding, then keep on reading.